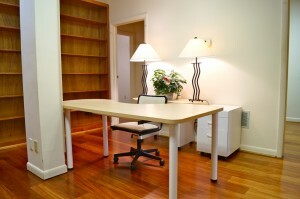 Spacious Downtown Office Suites just off The Downtown Mall! Enjoy a tour of these spacious Office Suites located conveniently in The Maclin Building, one of Charlottesville’s premiere office buildings only a half block from The Downtown Mall and steps from a public parking garage. The Historic Maclin Building offers a lavish entryway, easy-access elevators and penthouse-wide hallways. These Office Suites feature a furnished waiting room for your clients to sit and be impressed. The active tenant roster in The Maclin Building features the best-of-the-best in Charlottesville business, including lawyers, doctors, dentists, financial advisors and an advertising agency. When pricing these units, we researched the current Office Suite marketplace. These units offer the best value in Downtown Charlottesville. Each unit can be rented individually or combined to form a cohesive office. Each unit offers a different affordable price point. Take a coffee or lunch break from The Maclin Building and invite your clients to more than 50 restaurants or eateries on The Charlottesville Downtown Mall. Grow your business in Downtown Charlottesville today!